I've done posts using glitter in the past, including glitter phone chargers and even a glitter project round-up, but today it's time to take the sparkle to the great outdoors! err, well, at least as far as your windowsill. 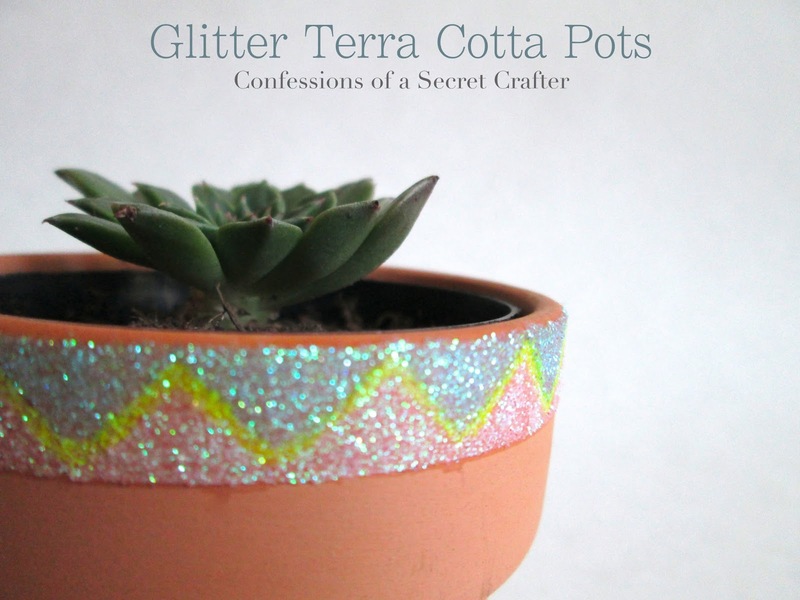 These glitter terra cotta pots are super duper easy and just as cute - they'd make great gifts and party favors...IF you can bear to part with them that is. Happy crafting! Sealant – I used Mod Podge clear acrylic spray in the shiny finish. Pre-crafting preparation: To help contain the excess glitter, you can put down a layer of newspaper. You may also want to keep a small hand-held broom or vacuum close by. Start by planning your pattern. For the triangle pattern, I traced a small cardboard triangle around the upper edge with pencil. For the striped pattern, I just taped off the first stripe using regular clear tape. Next up is the Mod Podge! Keep in mind that this step will have to be done quickly and in small sections so that the glitter can be applied before it has dried. The basic method is paint, glitter, paint, glitter, until you’ve finished. 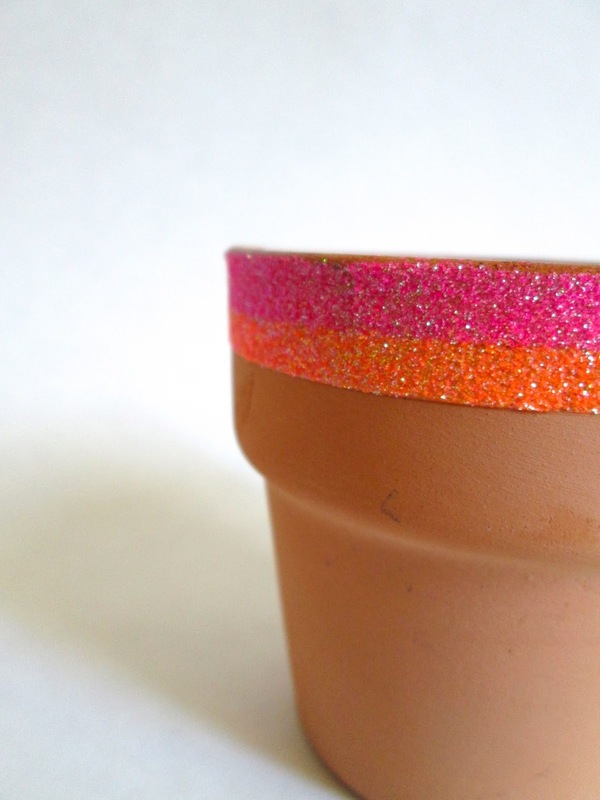 For both patterns, you’ll want to pour on a pretty thick layer of glitter. 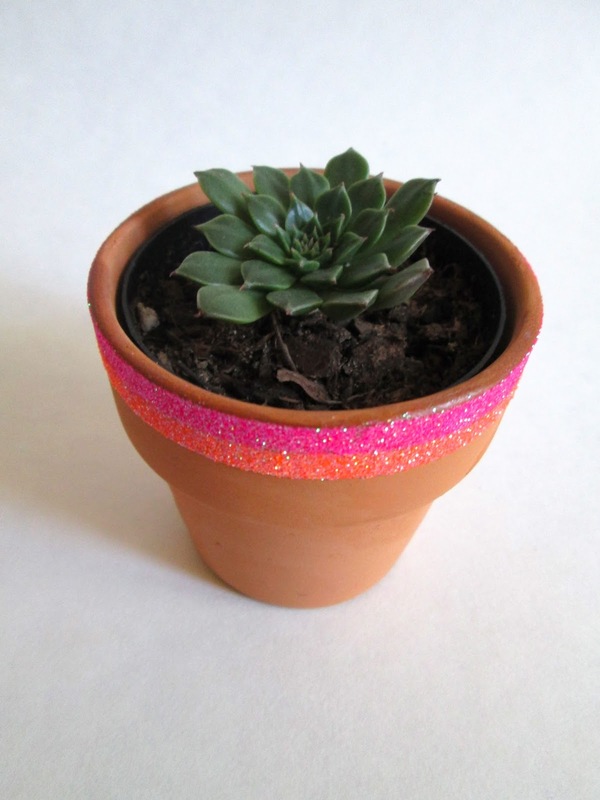 If you pat the glitter on, or dip the pot into the glitter, if will have a different look than if you pour/sprinkle. You may want to play around with technique before you start so that you can figure out what you like best. After covering each section, you can tap the pot gently against your work surface to knock off extra glitter. Be sure to remove the tape as soon as you’ve finished apply the glitter – the longer it sits (and the more the Mod Podge dries), the more likely it is to peel off your carefully painted stripes. Once you’ve got the method down, it should be fairly easy to complete. For the tringle pattern, I lined the first row using a super tiny brush and yellow glitter. I then taped off the bottom row, and filled in the left over spaces. For the stripes, you do it exactly the same as the second step. After allowing the pots to dry over night, you can tape off the plain areas and then treat them with the acrylic spray. You should do a light layer, allow it to dry, and then add more if necessary. I found that it was easiest to hold them upside down when spraying so that any excess drips off instead of running down the pot. This step should also be done outside, as it is very smelly and kind of goes everywhere. It should be left to dry for several hours - after 15 minutes it should be dry to the touch, but it takes much longer for the chemical smell to go away. That's it! 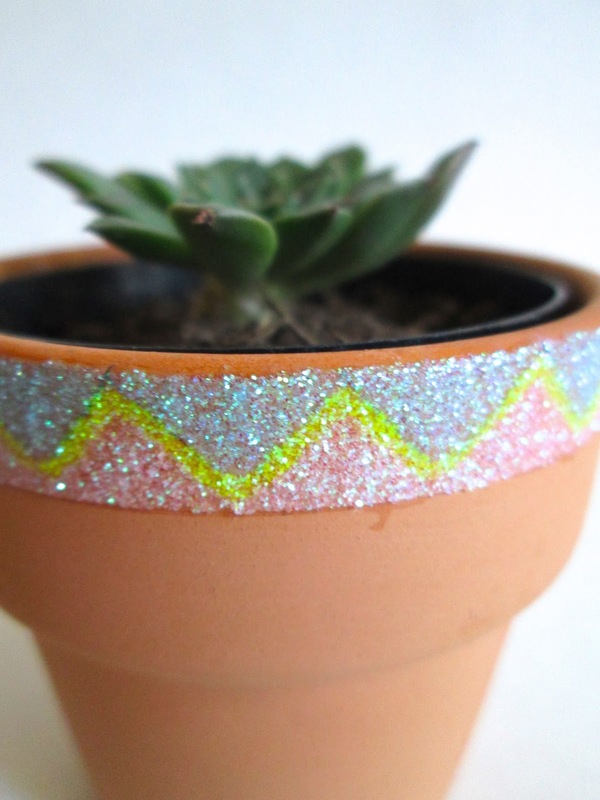 You've now got adorable custom terra cotta pots. I'm also planning to try the same technique with different colors and patterns, although for now I'm still digging the neon look. As always, thanks for reading! I love to hear from you, so please feel free to leave a comment below or connect with me on social media. This post was featured on Oh My! Creative, Huckleberry Love, Wait Till Your Father Gets Home, and Dream a Little Bigger. OMG....loving this idea! The glitter is perfect for spring. Now if only the weather would start cooperating. We are featuring you next week at the Creative Connection Party! Woo hoo!! Oh no way! Thank you so much Meredith! I LOVE these! I will be copying your idea and making some for my office! 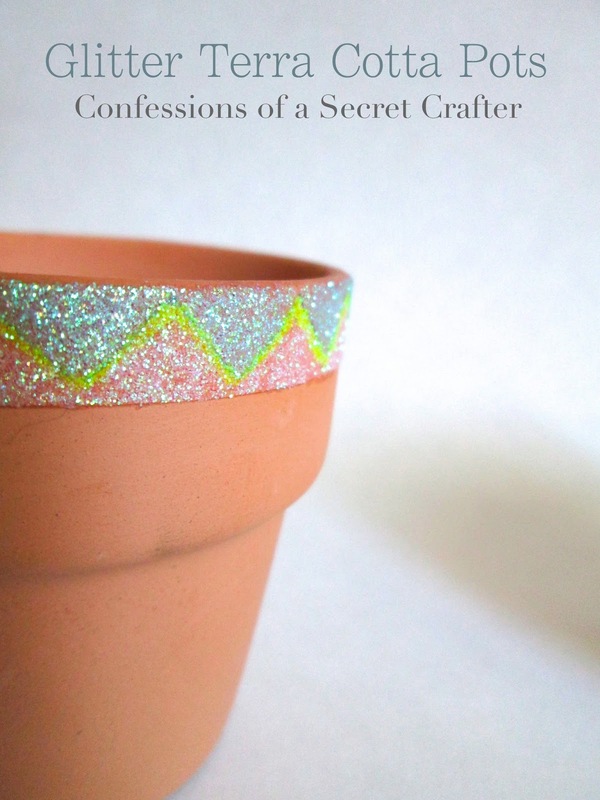 So pretty :) I love all of your fun glittery projects! So glad I'm not the only one with an addiction. Thank you so much for linking up at Thursday STYLE! Thank you Angela! I've always believed that you can never have too much glitter (even when the men in my life refer to it as the herpes of the crafting world). Thank you for hosting such a fabulous party! I look forward to it every week.